Wow, this carpet is disgusting! Hahahah! Utility knife! Slash! Rip! Goodbye old carpet! And from there it's a total re-do. Today I ripped out the remaining carpet except the bit under the bed. Shifting furniture to get carpet up has shaken a lot of stuff loose, literally and figuratively, and the giveaway pile is mounting. This afternoon I took the old window blinds down and masked the window trim for painting. With the windows bared, temporary privacy measures were required, so I hung the old curtains on the clothesline just outside the bedroom windows. Looks classy, huh? After she left, I started crowbarring the trim off and removing the doors, but I had to stop because my hands were hurting and the neighbors were going to start complaining about the hammering and that nasty nail-pulling screech. 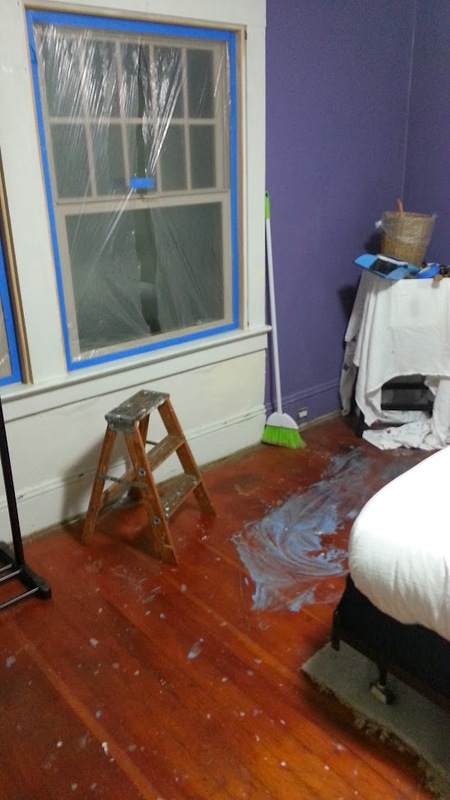 Tomorrow I'll paint the window trim. Maybe start emptying the closet. Ack! Go for it! Dismantle the closet! But what will you use instead? That song is great! I think every homeowner must have had an experience a bit like it. I want to replace the built-in closet with IKEA wardrobe units--they'll make much better use of the space, and they have nice drawers and racks and a million options. OMG, I wish I lived next door to *you*!!! Me too! You know what would be fun? You could drop by for coffee and we could sit with our feet up and admire the huge mess I'm making of my wee little house. I love reading all the things you've been up to with your house, it's so impressive! Heh. Well, it certainly takes on a certain je ne sais quoi when I photograph it and post the pictures. Honestly, posting about my projects is half the fun of my projects--and a kind of "contract" that keeps me going. May I suggest a layer of cork tiles over your floor? Then cover with a layer of varied area rugs for additional pattern and color? I've been looking at cork and bamboo. I like both choices, but may not be able to afford either. One of the advantages of adding a new layer of flooring is that it would allow me to put down heating mats. My bathroom floor is hot-water heated; it's heavenly, and I'd have it all over the house if it weren't so unbelievably expensive to retrofit. Next best thing would be electric mats warming the area around the bed and in front of the closet. LOL No one believes me when I say that once you spend years in the damp, rainy winters of Oregon that you just are not cold elsewhere in winter. In Kentucky I ran around in a sweater and flip flops in winter, in Colorado I wore a jacket mainly for the wind, not the cold and in Texas I put on a barn coat maybe twice this winter. Yup. After two weeks of sub-freezing temperatures here--complete with sunshine and dry east wind--everyone agreed that 40 degrees and raining felt colder.